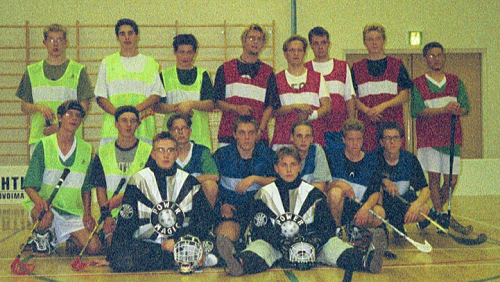 Jan-Torsten played his first season 1998-1999. During the 3 seasons he has spent with SC Saragoza he has played 33 games, scored 0 goals, assisted on 2 and spent 0 minutes in the penaltybox. The earliest goal Jan-Torsten has scored came into the game, and the latest goal he has scored came at . In one single game, his scoring record is 0 goals (13.02.2000 SC Saragoza-KaKo 1-1), and he has a record of giving 1 assists (14.10.2000 SC Alavus-SC Saragoza 8-3). The record for points is 1 and he has spent a maximum of 0 minutes in the box in one game (13.02.2000 SC Saragoza-KaKo 1-1). Jan-Torsten has scored in 0 games, and assisted in 2 games, and produced points in 2 games. In addition to that, Jan-Torsten has been penalized in 0 games. Out of these goals he has scored 0 in the first period, 0 in the second period and 0 in the third period. The assists have been given accordingly: 1 in the first period, 0 in the second period and 1 in the third period. The points have distributed themselves in the following way: In the first period he has produced 1 points, whereas he has produced 0 points in the second period and 1 points in the third period. The penalties have been handed out to Jan-Torsten accordingly: 0 in the first period, 0 in the second period and 0 in the third. In one season (Finnish Floorball Federation games only) he has recorded 12 appearances, scored 0 goals, given 1 assists and spent 0 minutes in the penaltybox. The stats for Aurinkoliiga are presented here below. In one season, the most games he has played in Aurinkoliiga is 4, where he has scored 0 goals, assisted on 1 and spent 0 minutes in the box. Throughout the years, a lot of practice games have been played, corresponding stats for these games are presented here. The record for games played during one season that Jan-Torsten has played is 3, where he has scored 0 goals, assisted on 0 goals and spent 0 minutes in the penaltybooth.